Christmas is next week. NEXT WEEK. I don't know if it's the whole being pregnant thing or perhaps it's the typical hustle and bustle of the season that has made me lose all track of time, but I am no where near as ready as I like to be with presents, plans, and everything in between. Instead of wrapping presents I've been folding baby clothes (they're so tiny!) and thinking about everything that needs to happen before our new little one arrives in just a few short weeks. Sometimes I worry that I'm not as prepared this time around. Maybe that's normal for the second baby. Maybe what happens is, since you've done it once, you figure having a newborn around is kind of like riding a bike. It isn't, of course. Riding a bike is much easier. 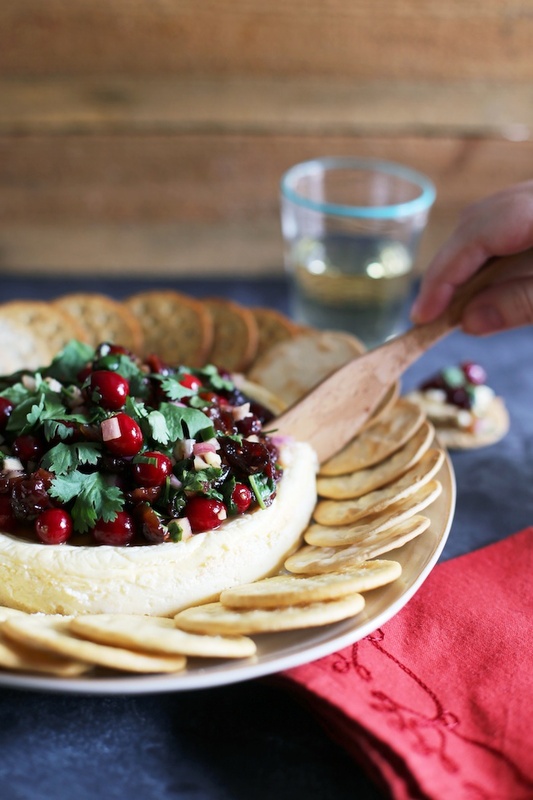 Lucky for me, I have the very best holiday appetizer on hand that can be made ahead and looks pretty and festive and like you spent hours working on it. 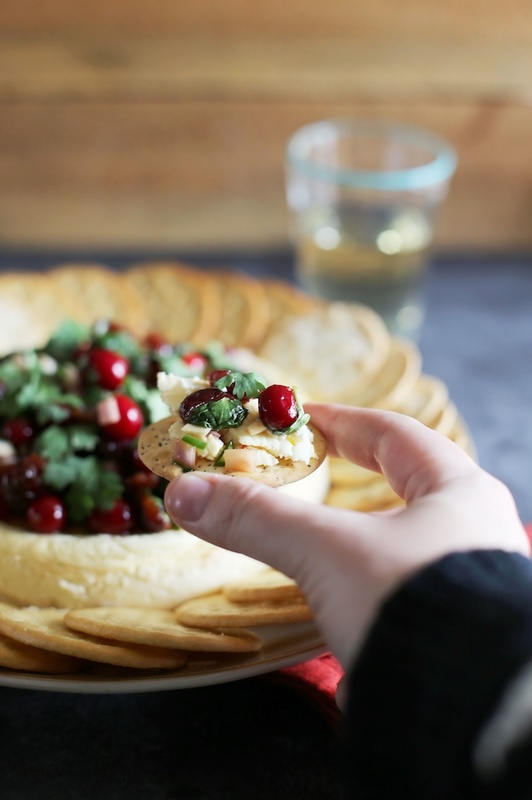 Cranberry-Jalapeño Relish with Savory Cheesecake = your holiday appetizer secret weapon. A college friend of mine gave me the relish recipe. It took me a while to get around to making but after one bite I was kicking myself for not making it once a week starting the second she sent me the recipe. Ellie, you've made my holiday season easier and more flavorful. Thanks! This relish could be used for any number of things but I love it over savory cheesecake. My savory cheesecake is simply cream cheese, greek yogurt, garlic salt and a couple of eggs. So simple you won't even know what to do with yourself. The relish and the cheesecake both last a couple of days in the fridge so they can be made ahead of time. To add a little extra color to the relish before serving, I like to add an additional sprinkle of cilantro. Other than that, the only prep you need to do before serving is to add a few crackers to the platter! What are your go-to survival tips for the holidays? Any food tips and tricks to keep us all sane? I'd love to hear anything and everything! Recipe barely adapted from my friend Ellie. Begin by combining the relish ingredients in a bowl. Toss together, cover with plastic wrap and refrigerate for at least 2 hours. Spray a 7 inch springform pan with cooking spray and wrap the bottom tightly with foil. Set the pan inside a 9x13 inch pan with 2 inch sides that has been filled with 1 inch of water. Combine the cream cheese, yogurt, garlic salt and eggs in the bowl of a stand mixer. Mix on medium-high speed until smooth. Pour into the prepared springform pan and bake for 45 minutes until the center jiggles just slightly. Remove the cake from the water and set on a wire rack to cool for 1 hour. At this point, you can place it on a serving platter and chill for 2 hours and up to 2 days. 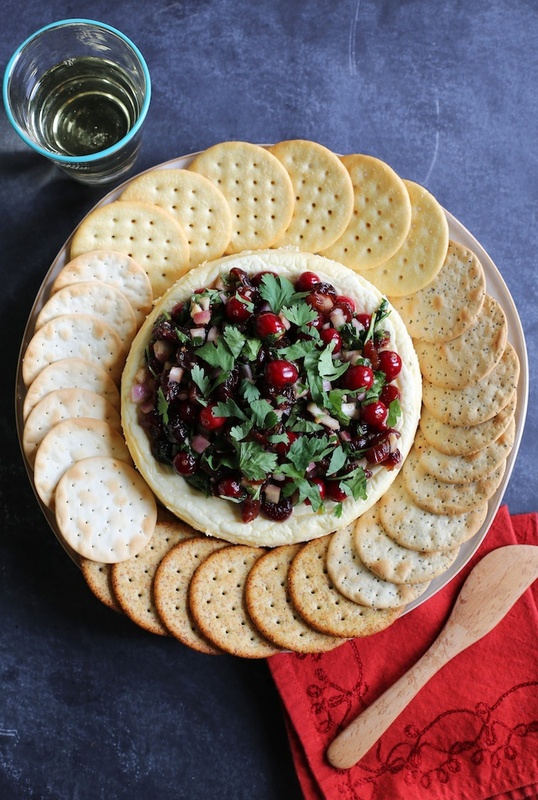 Top the chilled cheesecake with the relish and serve with a variety of crackers.